11th of April 2019: Polytechnic Faculty, University of Zenica: "Career and expectations management in IT"
On 11th of April 2019, I was given the opportunity to give a talk to the students of the Software Engineering at the Faculty of Polytechnic at the University of Zenica on the topic of "Career and expectations management in IT." It was my pleasure to do it in front of the students at the University in my hometown. As part of the talk, I tried to share some of the lessons that I learned throughout my career so far. We spoke about the importance of volunteering as one of the ways to gain work-related skills besides the knowledge gained throughout Academia. I underscored the importance of formal education as it gives the framework which enables people to cope with the situations that are in front of their professional careers, as well the mental framework that allows students to learn and quickly adapt to ever-changing IT landscape. Besides that, I tried to inform the audience about the importance of having mentors that can recognize the passion and hard work and steer people towards the right career paths. Moreover, we spoke about interviewing: what the expectations are from the candidates, how to answer some the questions that candidates might be asked and how to get attention from the companies candidate might be interested in. Also, we spoke about the format of the interviews and how that is changing lately. Also, I ensured to mention how work is being evaluated at some of the companies that I worked with. In the end, we spoke about the importance of configuring and ensuring proper working environment as well as maintaining the right balance between work and outside of the work activities. Most importantly, at the end of the presentation, I ensured to mention the importance of taking care of both physical and mental health. Overall, it was my pleasure to speak with those young, enthusiastic group of people that emit such a good and positive energy. In many ways, they remind me of myself when I was younger. 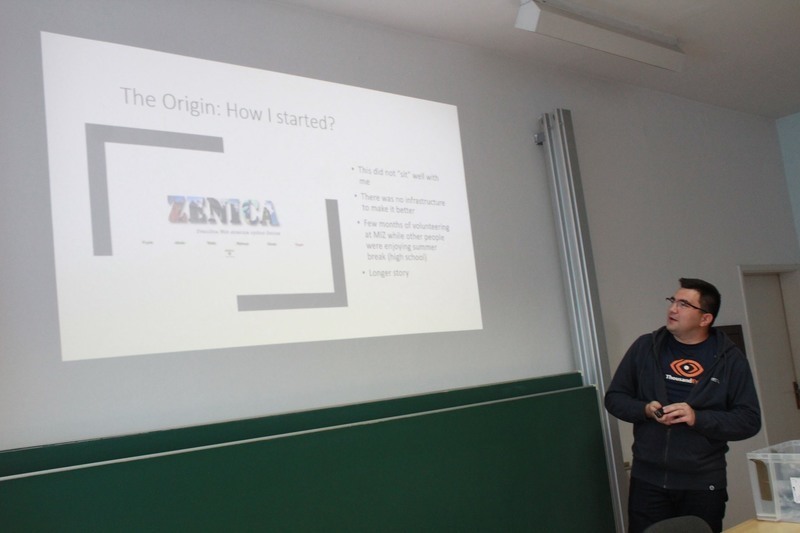 23th of March 2019: HammerIT conference organized by ZeForge community: "Do we need to rethink network monitoring?" On 23rd of March 2019, I was allowed to be one of the speakers at HammerIT conference organized by the ZeForge community, based in my hometown Zenica, Bosnia and Herzegovina where I presented a talk on the topic of "Do we need to rethink network monitoring?". I was quite excited to present at this event as this marked the first presentation that I did in my hometown after thirteen years (besides some smaller events such as meetups). The last presentation that I did in my hometown was at 3rd Zenica Linux Seminar which I helped organize with the help of my friends. We hosted three seminars in total, starting with the first one in 2004., followed by the second one in 2005. And the last one in 2006. So, having the opportunity to speak at this event was something that I was quite happy and excited to do. I was positively surprised at how well and the professional event was organized. There were nine sessions in total, as part of which three sessions were going in parallel. Overall, it was quite a fantastic event. What makes me happy about this is the fact that someone took the torch from us that used to work on those things all of those years back. Both Bosnia and Herzegovina and City of Zenica deserve to have big IT scene, and this is the step in the right direction. As part of the talk, I tried to present some of the challenges that network operators are facing as a result of the reactive nature of network monitoring while using traditional troubleshooting toolsets. The presentation indicates specific improvements that were created over time to resolve some of the challenges with the conventional toolset but puts into the first plan importance of the Active Network Monitoring. We don't stop there, we tried to cover some of the challenges while implementing Active Network Monitoring in local and data center networks as well as one label switched backbones, and we provide some of the solutions or potential solutions to resolve those. In the end, I would like to congratulate ZeForge team on hard work that they put into this, and I hope that we are going to see much more of similar events in the future. iNOG::11: "Do we need to rethink monitoring?" A couple of weeks ago, I had the opportunity to speak at Irish Network Operators Group on the topic of "Do we need to rethink monitoring?". If you are working in Engineering, especially if you are Engineering manager, you should read (or listen, as it is beautifully narrated) It Doesn't Have to Be Crazy at Work. Just by reading the preface, you will understand that you are in for a treat. It is hard to believe that they managed to put so much awesome in what is, essentially, less than four hours of listening time. The Economist calls the book "funny, well-written and iconoclastic and by far the best thing on management published this year," and I couldn't agree more.